When I think about education and Champagne, I'm reminded of the famous line about the weather - "Everybody complains about it, but nobody does anything about it." Regarding Champagne education, change that saying to "Everybody knows what Champagne is, but almost no one knows much about it." It's true, to a large degree. Champagne has become a generic word for sparkling wine. With all due respect to Franciacorta, Prosecco, Cava and other classic method sparkling wines, they're not Champagne. Champagne is a specific product from the Champagne region in France and to put it simply, you cannot replicate that anywhere else in the world. So Champagne is unique, but there is a lot more to Champagne than just a sparkling wine from France. 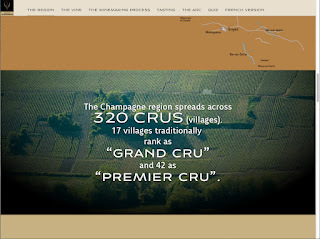 It's about a specific process with specific varieties from vineyards spread out over several districts. It's about a wide array of styles, from non-vintage Brut, the most widely available Champagne to particular cuvées, such as Blanc de Blancs to Rosé to Blanc de Noirs and several others. In my opinion, few people in America - and many other countries - have a good grasp on the complexities of the subject of Champagne. Ironically, some of these same individuals know a great deal about the various differences in classified Bordeaux and why the wines of Pomerol taste different than those from Pauillac or why a Burgundy from the Cote de Beaune varies so greatly in style than that of a wine from the Cote de Nuits. There are countless other stylistic differences from great wines around the world, but for too many consumers, Champagne is Champagne. So education is desperately needed. I conduct small Champagne classes/dinners from time to time in Chicago, tasting out 5 or 6 Champagnes, representing cuvées ranging from Blanc de Blancs to Vintage Brut to Rosé and match these wines up with food. But I can only reach a small group of individuals. There are detailed books on Champagne, several of them excellent (especially from Tom Stevenson and Essi Avellan, Tyson Stezer and Gerhard Eichelmann). I highly recommend their books, as they are excellent studies of the leading Champagne houses as well as examinations of how Champagne is made. But given today's need for quick information, books suffer, unfortunately, compared to the internet. You can argue all you want about whether books or the internet are better sources for information, but you have to accept that the internet has changed the way we look at things, and it's here to stay. 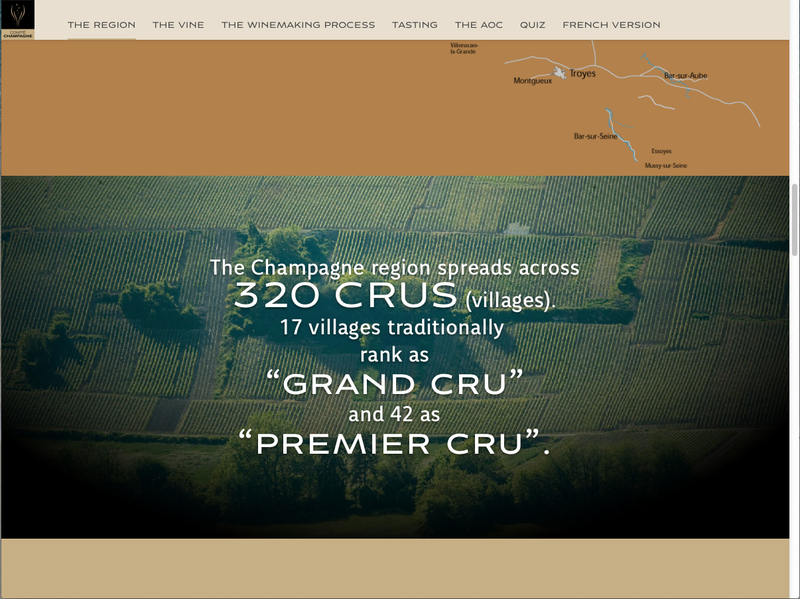 That's why it's such great news that the Comité Champagne - the CIVC, headquartered in Epernay in Champagne - has put together the Champagne Campus on their website (champagnecampus.com). 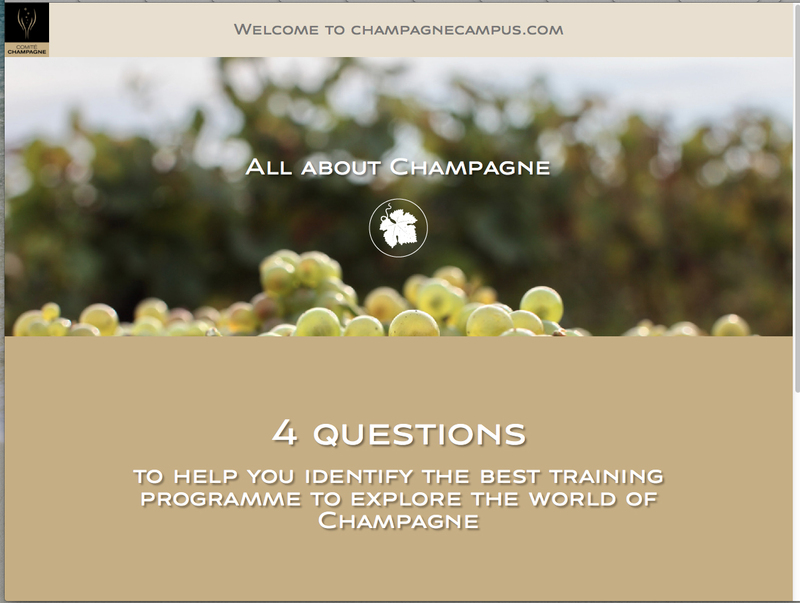 This is an excellent way to learn about Champagne, as this online course is loaded with facts about numerous topics, from vineyard classification to grape varieties to production information. There are detailed maps as well as beautiful photos and it's a pleasure to read and look at. What I love about the Champagne Campus is the fact that you learn about Champagne at your own level. When you first go to the site, you are asked four introductory questions to test your knowledge. Depending on how many of these you answer correctly, you are then told that you should study one particular level of the course, ranging from Novice to Lovers to Enthusiasts. Neat idea! There is so much in this course, not only maps and basic facts, but also a great deal about history, climate, soils and even vine training (yes, this is a serious site about Champagne!). It's extremely well done and you can go back and forth between levels to make sure you're not missing anything. While the best way to learn about Champagne is to open several different bottles and compare and contrast, Champagne Campus is a great complement to tasting Champagne, as you'll get a better understanding of what this wonderful beverage is all about. A toast to the CIVC for creating Champagne Campus. I hope that millions will visit the site!